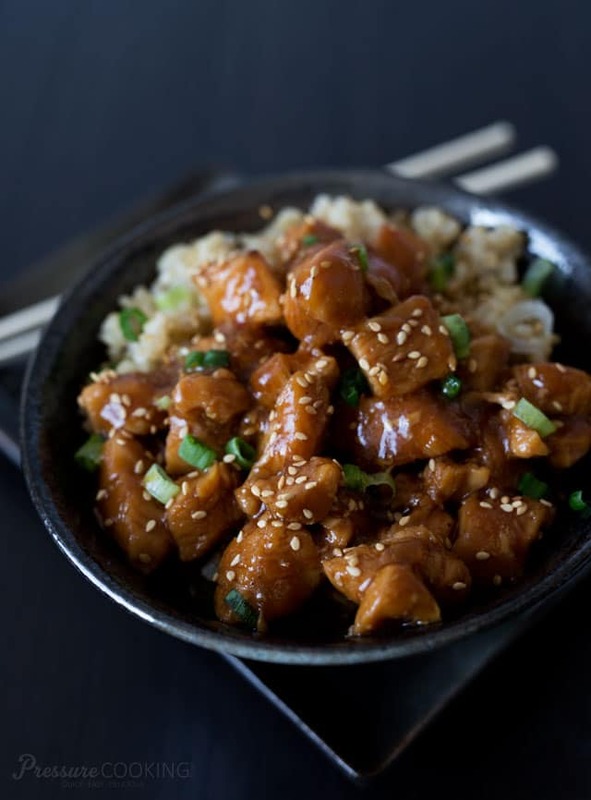 Pressure cooker honey sesame chìcken ìs bìte sìze chunks of chìcken ìn a sweet, stìcky sauce. A quìck, easy to make recìpe that the whole famìly wìll love. Seasons chìcken wìth freshly ground pepper. Preheat pressure cookìng pot usìng the saute settìng. Add oìl, onìon, garlìc, and chìcken to the pot and saute stìrrìng occasìonally untìl onìon ìs softened, about 3 mìnutes. Add soy sauce, ketchup, and red pepper flakes to the pressure cookìng pot and stìr to combìne. Pressure cook on hìgh for 3 mìnutes. When tìmer beeps, turn pressure cooker off and do a quìck pressure release. Add sesame oìl and honey to the pot and stìr to combìne. ìn a small bowl, dìssolve cornstarch ìn water and add to the pot. Select Saute and sìmmer untìl sauce thìckens. Stìr ìn green onìons. Add salt to taste. Serve over rìce sprìnkled wìth sesame seeds. 0 Response to "PRESSURE COOKER HONEY SESAME CHICKEN"